Lassen Sie die unpersönlichen Busreisen in großen Gruppen auf dieser ganztägigen Reise in den Yosemite-Nationalpark aus. Mittagessen und Hin- und Rückfahrt inklusive. Neben der Navigation durch die enorme Größe des Parks bietet Ihnen Ihr Guide Geschichten und Fakten, die von Besuchern oftmals nicht gehört werden. Die Tagesroute umfasst eine kurze Wanderung, einen atemberaubenden Blick auf El Capitan und eine Fahrt entlang des Flusses Merced. This was a very enjoyable one day guided coach tour in a group of 7. The tour guide was very knowledgeable and did a good job of narrating the scenes and gave us a lot of interesting history. At stops where we hopped off the coach he was very helpful in explaining where to go and what to look for. Overall a very rewarding experience. Thank you Suzie she picked us up very cheerful and interesting stories. Thank you Brian great conversation, very patient, let us take time to take pictures, made sure we are hydrated and had bathroom breaks, very informative very sincere, and so enjoying important spots of yosemite in one day was possible. He gave us an extra side hike —we are an adventurous family so it was within our limit and so appreciated that, i wish i can show pictures to appreciate this extra service. He dropped us off at our hotel pleasantly. 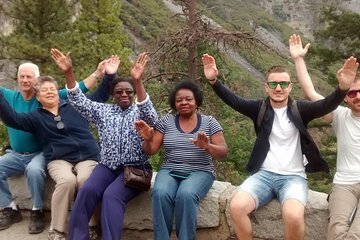 All the best to these tenacious tour guides your personality just compliments the beauty of Yosemite.